Holidays are always fun to decorate for and we have a full line of beautiful or fun decorative flags for the holidays. Choose a flag and then check out the mailbox covers, yard signs and floor mats to create coordinating holiday themes. Be Mine Applique Flag Garden - 12" X 18"
BEE MINE Applique Garden Flag - 12" x 18"
Blackboard Christmas Decorative Flag - Garden 12.5" x 18"
Boo Ghost Decorative Flag - Garden 12" x 18"
Boo Ghost Decorative Flag - Standard 28" x 40"
Boo Light and Voice Controlled Flag - Standard 28" x 40" - $9 OFF !!! 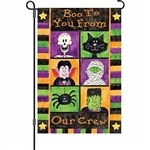 Boo Y'all Decorative Flag - Standard - 28" x 40" - $4 OFF! Born and Raised Decorative Standard Size Flag - 28" x 40" - $2 OFF!! Build Snowmen Decorative Flag - Garden 12" x 18"
Build Snowmen Decorative Flag - Standard 28" x 40"